Is Your Reputation As Shiny As You Think? Build Your Authority and Credibility Online! Reputation Is A Big Deal To Your Customers! Your online business reputation is the new "word of mouth" marketing. Over 70% of consumers trust online reviews as much as personal recommendations. Did you know most consumers read up to 10 online reviews of a local businesses before making a purchasing decision? Customer reviews are A MAJOR factor in organic search ranking. Reviews send you Quaified customers because buyers trust reviews. Marketing will not work for you if you have a poor online reputation and negative reviews. The way consumers purchase goods and services has changed since the spawn of the internet. Despite this, businesses still need to concentrate on customer relationships. Customers can write a review (good or bad) about your business anytime, anywhere from anyplace. They carry a mobile printing press in their pocket everyday. This means, you need to be ready to address those negative reviews and broadcast the positive reviews. Just 1 bad online review is enough to scare away a customer for life. What's more might not even know you have that bad online review. People are talking about you online. Your Reputation is all You Have! Make sure you know what your customers are saying about you online. video is the communication tool that shoppers prefer. Bad Reviews Show Up In. What exactly is reputation marketing? How do I create a reputation marketing strategy? How do I create a great reputation online? how do i remove bad reviews? whats the best way to get good reviews? 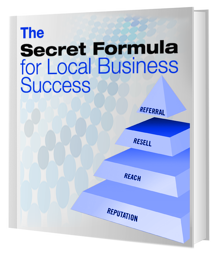 What Local Businesses Use To Fuel Growth and Outperform their Competition.